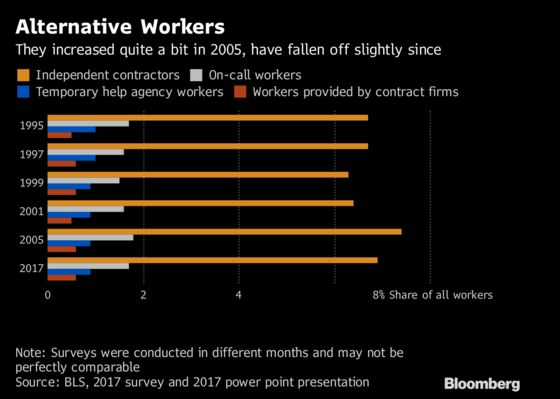 (Bloomberg) -- The share of Americans who may be classified as part of the “gig economy” has shrunk since 2005, according to a government report that also showed such jobs are increasingly concentrated among older workers in an aging labor force. The Labor Department on Thursday said 10.1 percent of Americans in May 2017 were on alternative work arrangements -- which includes independent contractors, on-call workers and people working for third-party contractors -- down from the 10.7 percent in the last report in 2005. That decline resulted mainly from a drop in the share of people identifying as independent contractors, which fell to 6.9 percent from 7.4 percent in 2005. Below the surface, the data showed that Americans age 55 and older constituted bigger shares of independent contractors in 2017 than in 2005. That suggests that the aging Baby Boomers are accepting such positions, whether it be to supplement incomes or because they may be easier to take than traditional jobs. The labor-force participation rate among people 65 and older stood at 19.8 percent last month, compared with 15.2 percent in May 2005. More than one-third of independent contractors were age 55 or older in May 2017, while the age group accounted for less than a quarter of workers in traditional arrangements, according to the report. “This reflects the fact that the likelihood of employed persons being independent contractors increases with age,” the Labor Department said. One caveat surrounding the figures may be that previous versions of the survey were conducted in February, rather than in May, which could influence the types of jobs available at different times of the year.